“Anthracnose” is a term used to describe a class of leaf spot diseases, a little bit like we use the term “flu” to describe a host of different influenza viruses. Anthracnose type diseases are very common in California. In most cases, they don’t cause permanent damage to established trees. However, trees stressed by root restrictions, drought, and heavy insect infestation are much less tolerant of this fungus and may show decreased vigor because of infestation, and a few anthracnose diseases can be deadly to certain species. Anthracnose damage is commonly limited to conspicuous spots or irregular dead areas on leaves and twigs, which may cause foliage to become distorted and drop prematurely. Anthracnose does not seriously harm plants unless defoliation occurs repeatedly or branch dieback or cankering is extensive. 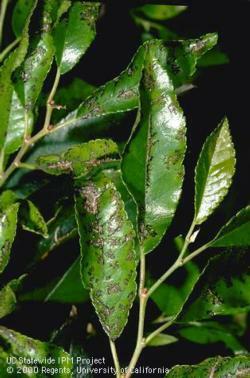 Chinese elm anthracnose, also called black leaf spot, is one of the most serious anthracnose diseases. Appearance: Irregular, black, tarlike spots on leaves, premature leaf drop, and twig dieback are common symptoms of Chinese elm anthracnose. More serious damage is caused by cankers on the limbs and trunk. Even vigorous Chinese elms (Ulmus parvifolia) may become girdled and die from this fungal disease in coastal areas of California. Chinese elm anthracnose is rarely a problem in hot interior areas of California. In Marin County, trees in the cool, moist, summer areas of southern and coastal Marin may not recover from Chinese Elm Anthracnose and may die over the span of several years. In the hotter, dryer areas of Marin, such as central and northeastern Marin County, trees may be able to survive indefinitely, even with the disease. A severe case of anthracnose may cause defoliation in the spring, but the tree usually recovers and produces a second crop of leaves later in the season. Severe defoliation year after year, however, may weaken the tree and increase its susceptibility to insects, other diseases, and stressful environmental conditions. In addition, branch structure may be affected by the disease. Contributing factors: The fungus overwinters in dead leaves on the ground and in dormant buds, and spores are released in spring to infect new growth. Splashing rain helps to spread the spores. Management recommendations: Remove leaf debris and dead shoots from the trees and the ground, especially before rainy weather is expected. Avoid tight spacing and overhead irrigation. Prune infected branches to the next healthy lateral. Pruning the canopy to promote air circulation may help reduce infection levels in the canopy. In summer during dry weather, excise small cankers on the trunk and major limbs before they become large by cutting about ½ inch into healthy wood, which will allow wounds to close. Do not make large wounds. Consider replacing severely infected trees. 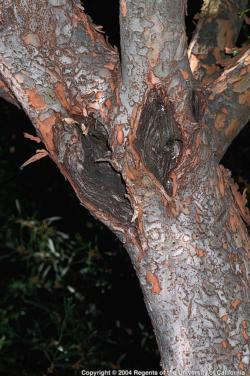 Plant the Drake cultivar of Chinese elm as it is less susceptible to anthracnose canker fungus. 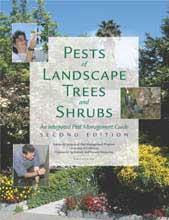 From “Pests of Landscape Trees and Shrubs” an Integrated Pest Management Guide, 2nd Edition, UC-ANR.